We’ve been taking the wrong approach to communicating about climate change. I get that the situation is dire. Really dire. But it goes way beyond the fact that every year is the hottest year on record, sea levels are rising, drought is forcing millions into refugee status, the Great Barrier Reef is almost dead, the oceans are 26 percent more acidic than preindustrial levels, our topsoil will be gone in less than 60 years, and we’re already at least 1.5 degrees Celsius toward the two degrees said to herald a real catastrophe. That’s all bad. The reality is actually worse. By any rational analysis, civilization as we know it is on the brink of true disaster. And despite their outward messaging, even climate-denying, anti-scientific, messianic nations like the United States are quietly preparing for the coming storm. No, they’re not looking at how to mitigate climate change, but how to prepare for its inevitability. We’re building walls — not to keep out today’s immigrants, but to block tomorrow’s climate refugees. We’re being trained by our president and other leaders in the dark art of seeing people from other nations as less than human — a trick that will make it easier to watch as flooding and other climate catastrophes wipe out millions. “At least it’s them and not us,” we’ll be able to tell ourselves. This sort of alienation verging on sociopathy takes time to develop. But we’re working on it. These are the sorts of things people do when they feel powerless to effect any change. They see the future as fixed — as something to predict and prepare for — but utterly impervious to their intervention. It’s the posture toward the future assumed by most corporations. They hire futurists and scenario planners to tell them what is most likely to happen 10, 20, or 50 years from now so they can invest in whatever is going to be valuable in that environment. Back in the 1980s, the futurists started talking about the coming water crisis. That’s what turned water into a private commodity — accelerating and worsening the very crisis they predicted. Likewise, any futurist worth their coverage in Wired is telling their corporate clients about the coming global climate crisis in stirring detail: which regions will be underwater; how temperature changes are likely to effect social unrest, politics, and violence levels; how and where the populations of Africa and Southeast Asia will migrate; and so on. We’ve won the communications battle in the sense that the rich and powerful now accept the reality of climate change and are actively betting on it happening. They believe us. But we’re losing the war in that they don’t believe the crisis can be averted. As speculators, they’re more committed to betting on the most likely future instead of investing in the future they’d like to see happen. In the finance world, betting on what you hope for is derided as “emotional investing.” One is supposed to bet only on existing probabilities — not on one’s genuine goals or dreams. And this mentality is self-perpetuating. The more we invest in the inevitability of climate disaster, the more assuredly we bring it on and the more devastating a future we are creating for ourselves. If we’re going to get business on our side (after which government is sure to follow), we have to convince them that the most likely future scenario is one where the whole world tries to get in on the bet that we can avert climate change. Or at least we can mitigate its effects. Slow it down. Build more resilience. We have to show that the world is on board and ready to do and pay for what is necessary to keep the planet livable for the vast majority of species. As a thinker who is often mistaken for a futurist, the last thing I should be doing is standing in front of people and telling them how many millions or billions of people may die, how mass migrations will threaten the sanctity of nation-states, or how the oceans are on the brink of death. Because then my audiences will start betting on those outcomes. No, the people who needed to hear the alarm bells have heard them. Those who didn’t — who couldn’t — respond to the warnings with anything but self-interested bets on shotguns, iodine tablets, water futures, and land in New Zealand? They need to hear a different message. They need to hear that climate change is about to be defeated. If they don’t get in on climate remediation now, on the ground floor, they’ll miss the opportunity. This is the chance to invest in organic agriculture and to sell short on Monsanto and Big Agra. This is the time to go all in on solar, wind, and geothermal. 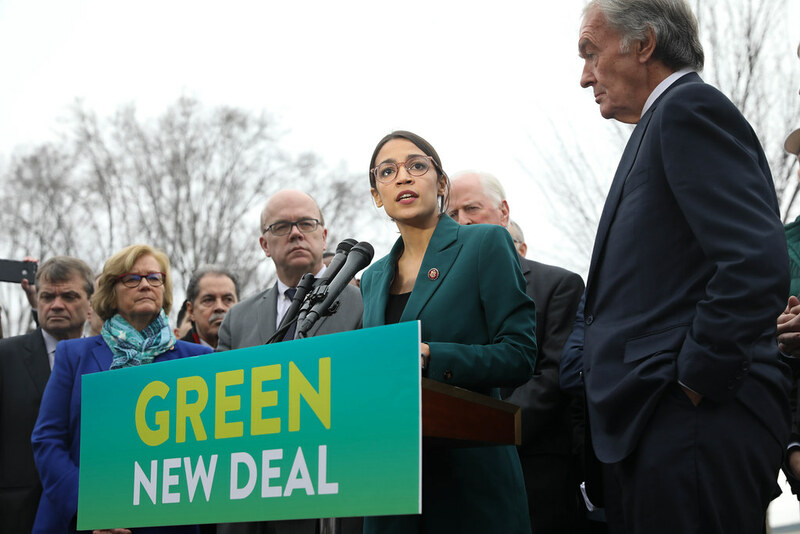 And once they do — once the big money is really in — just watch as Wall Street starts lobbying for the Green New Deal proposed by Alexandria Ocasio-Cortez and others. Net-zero greenhouse emissions is not a pipe dream, but a plausible, positive, attainable goal. Let’s start talking about our collective sustainable future in ways that make people bet on it.